After an exhausting, but incredibly exciting, four weeks at the winter Olympics in Torino, I was ready to relax for a couple of weeks in the Dominican Republic, enjoying the sun, the sand, and the sea. It was exactly what I needed. Before long I was feeling refreshed and looking forward to seeing my grade 3 friends again, and to continuing my adventures. As soon as I returned to Stittsville I asked my traveling companion where, and when, our next trip would be. He told me that we would soon be leaving for Berlin, Germany. Germany is very near Switzerland, so I already knew quite a bit about it. One of the four official languages in Switzerland is German. (That’s right, Switzerland has four official languages.) 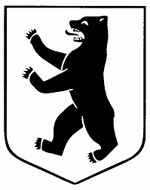 Although Geneva is in the French speaking part of Switzerland, some of my close friends in Bear school were from the German part of Switzerland. 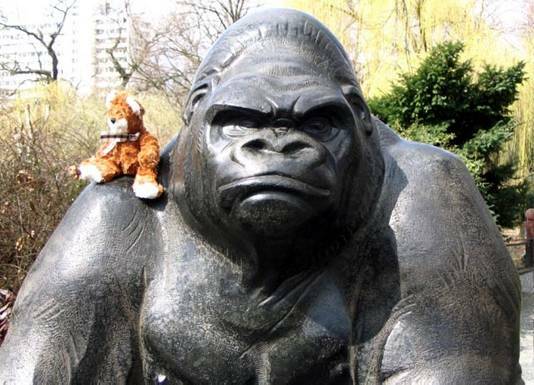 You might be surprised to learn that even though it was very close, when I first met my traveling companion I had never actually been to Germany even once. So I was quite excited when my traveling companion told me about the trip, and as I often do, I began doing some research in preparation for my next adventure. I knew straight away that I was going to like Berlin. 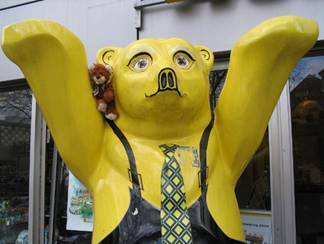 How would it be possible not to like a city that has a bear as its symbol? I even discovered that the city was founded by a king called Albert the Bear! At first I was very excited because I thought Albert had been a real bear, but I later discovered that he was just a person. I suppose he must have been as strong and courageous as a bear, so that is almost as good. In a city founded by a bear, and with a bear for its symbol, you might expect to see quite a few bears wandering around, and you would be right. 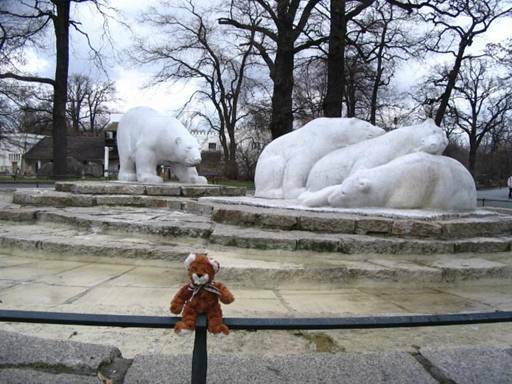 I saw many bears on the streets of Berlin. They were friendly like most bears are, but I have to say that they were not dressed like any bears that I have ever seen before. It was very strange indeed. 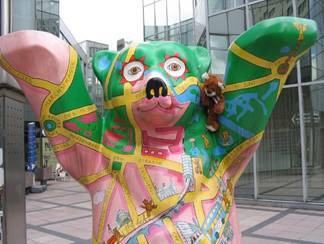 One bear was wearing overalls with a tie, and another had a strange coat that looked like a map of the city of Berlin. The confusing thing about the map on the bear’s coat was that it had pictures of bears walking down the streets. I wondered if the bear wearing the map was one of the bears on the map. Then I wondered if the bear on the map was also wearing a coat with a map on it. Would there be bears on that map too? My head started to hurt when I thought about that, so I decided I would just say hi and give him a big hug instead. As you know, when I was growing up in Geneva, my father worked as the head of security for the Aboriginal Bear Committee - the “ABC”. I knew the ABC had an office in Berlin, so I dropped in to say hi to some of my father’s old friends. 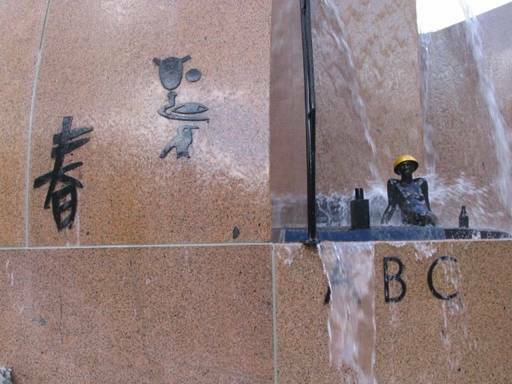 In front of the office, they even had an interesting fountain with the ABC logo on it. I enjoy spending time with humans, but it just isn’t the same as being able to visit with bears. We talked about old times, and I told them all about my adventures. They were very interested, and kept saying how brave I was to have visited all these strange places. I didn’t think it was very dangerous at all, but they were still impressed, and looked like they were considering something. Finally they asked me if I had ever thought about going into the security business, like my father. It wasn’t something that I’d ever really thought about. It did seem to be worth considering, but not while I was still having such wonderful adventures. The older bears smiled when I said that, but they suggested that maybe it would be possible to do some security work and still have my adventures. That sounded like a fantastic plan, but it just seemed too good to be true. I thought they were just teasing me, but then they said they had a security contract that was perfect for someone with my experience. The job was to provide security for an international organization that was meeting in a nearby hotel for the week. There were people from all around the world, so someone who had traveled as much as I had would be perfect for the job. As my friends told me more about the job, I kept thinking how much it sounded like the meeting my traveling companion was attending. Then they showed me the contract, and I realized it was the very same meeting. It certainly is a small world sometimes. I discovered that it can be very hard work providing security. I had to be alert at all times, because you never know where danger might come from. All that concentration made me hungry, so I was pleased to see there were healthy snacks to keep my energy up. Fortunately, in addition to being healthy, the snacks were just my size. I was familiar with some of the “bear-sized” snacks, but there were also some that I have never seen before. One of these was the bananas. 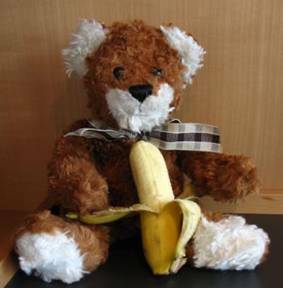 I have seen humans eat bananas before, but they have always been much too large for me to eat. These bananas were just my size, and I enjoyed them very much. I liked the security job, and I think I may do it again. It was only for one day, but that was perfect because it left the other days free for me to wander around Berlin. At first I wasn’t sure what I should see. I investigated some of the sights near the hotel. The most interesting was a tower with stained glass windows that looked very impressive at night. 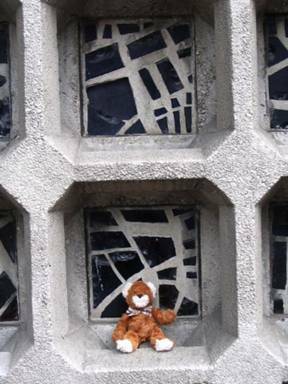 When I went to have a closer look, I could see that each of the windows was made of very small pieces of stained glass. Many of the pieces were chipped and broken, which seemed very strange. I asked someone about it, and they said that after the Second World War, all the Cathedrals in Berlin had been destroyed by bombs. The citizens gathered up all the broken pieces of stained glass, and used them to make the tower so that everyone would remember the horrors of war. I found it very emotional to stand beside the tower, and think about what it must have been like. I think it is good to remember. 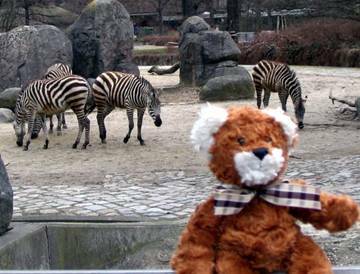 When I was walking around near the hotel, I suddenly saw a sign for the Berlin zoo. We were right in the center of the city, so I never expected to see a zoo only a short walk from our hotel. 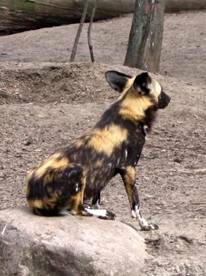 I was amazed to discover it is one of the largest zoos in the world, with nearly 2000 different animals to see. 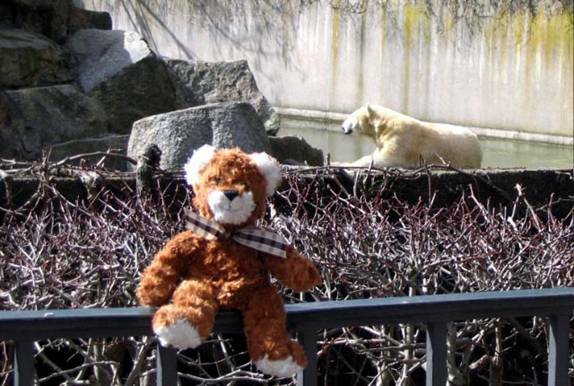 I was especially pleased to see the zoo had several bears. 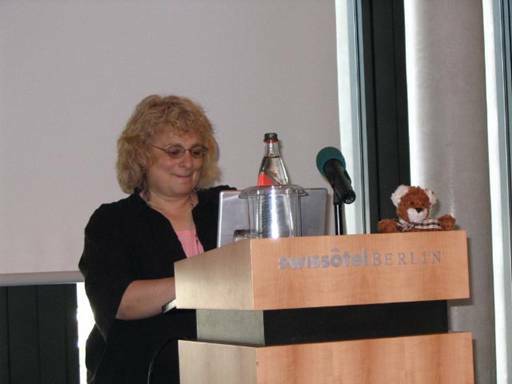 The bears decided it for me, and that afternoon I found myself walking through the famous Elephant gates of the Berlin zoo. Of course, I had to stop to say hi. 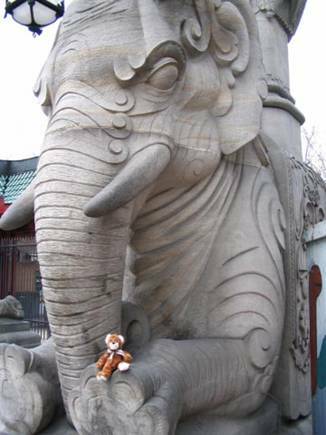 The elephants were very big, and could have easily crushed a person or a small bear by accident. Fortunately, they were gentle and sat very still while I had my picture taken with them. Perhaps they sat so still because they were just a tiny bit frightened by all the people. I know that sometimes when there are lots of people around, I can sit so still that people don’t even realize I am breathing. Maybe it is the same for them. The zoo was amazing. If you ever visit Berlin, I highly recommend that you spend a full day seeing the animals. I tried to see as many as I could, but there were too many to see them all. The ones I did say hello to seemed glad to see me though, and many of them came over to have a nice talk. Perhaps they were so friendly because I am a bear, but I’m sure they would be pleased to see humans as well. They told me about the interesting places they came from, and what it was like there. Sometimes I begin to think I have been to most places around the world, but then suddenly I realize there are still so many more places to see. In some ways it makes me sad, but in other ways it makes me happy. So many more adventures! I smiled as I thought about all the places I might see on future trips. My first stop at the zoo was the Panda. 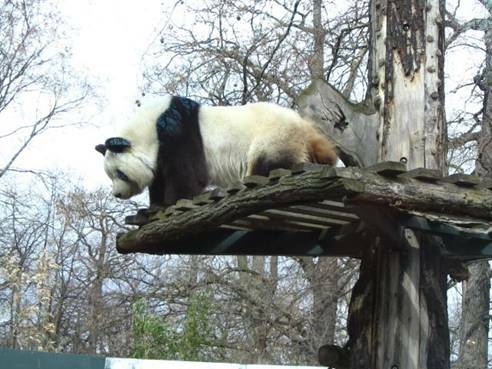 They call him a “Panda Bear” even though he isn’t really a bear. I’m not one to worry about such things though. The Panda looks like a bear, and he is one of my friends, so I went to see him first. We had a lovely visit. 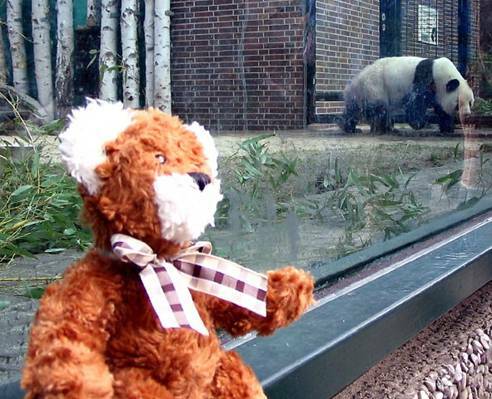 I enjoyed my visit with the Panda, but when I was finished, it was time to see the real bears. 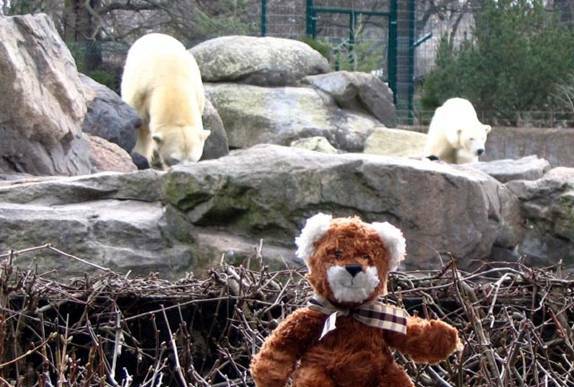 The next stop was the Polar Bears. When they heard I was living in Canada, they all wanted to talk to me. I think it may have made them homesick, but they were still very pleasant. 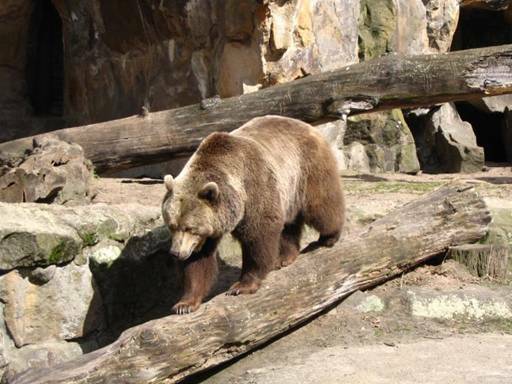 There were many bears at the Berlin zoo, but one I just had to visit was the Grizzly bear. When I mentioned Canada, he came right over too. I’m beginning to think that Canada has a lot of bears! It makes it so much more interesting when you are visiting another country, and you meet people, or bears, from the country you are living in. Most of the animals were in cages. I suppose it was to protect them from the people, but there were some very special animals that were allowed to roam free.. They didn’t seem to need protection. I think it may have been because they were used to people, although it could have been because they knew how to stay very still whenever people were around. They were so still that most of the people thought they were statues, rather than real animals. They told me that people would walk by them as if they weren’t even there. 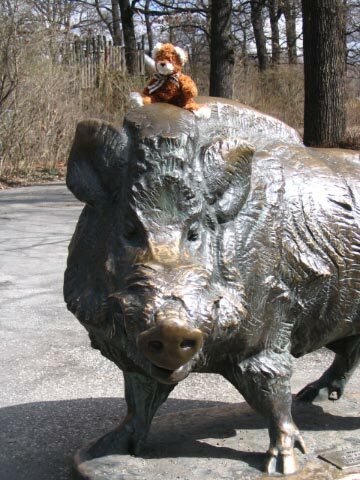 I knew that the wild boar could have skewered them with his tusks if he had wanted to. The Polar bears could have sliced them in half with their claws, and the gorilla could have ripped them into two pieces with his bare hands. The people had no idea though, and walked by completely unaware. We had a real chuckle about that. While we were talking we sat very still, and I used my quiet voice, so I’m sure the people thought that I was just a stuffed bear. People are usually so smart, but sometimes they are incredibly naïve. As the afternoon came to a close, I knew I had to head back to the hotel to meet my traveling companion for the evening. I was sad to say goodbye to all my new friends, but I’d had such a wonderful afternoon that I couldn’t feel sad for long. I made a final brief stop to see some animals from deepest darkest Africa. As I headed back to the Elephant gate, I waved goodbye and told everyone I hoped I could make it back to visit them again soon. Right beside the gate there were signs pointing to all the animals in the zoo. 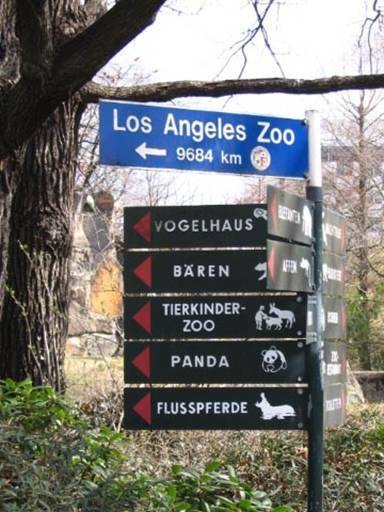 Of course the sign was in German, but Panda is the same, and I knew that Baren was German for Bear. It reminded me again of the new friends I had made. I noticed that at the very top of the pole was a sign telling me that the Los Angeles Zoo was only 9684 km away. That started me thinking. I’ve never been to Los Angeles. In fact I’ve never been anywhere in California. Perhaps I’ll have to take a trip there before too long.